Our most popular products can be ordered directly. We can also supply specialized items and parts. Please call us for information or special orders at 1-800-350-8176. The term “mortise chain” often refers to the complete set composed of a chain, a guide bar and a sprocket, used to produce slots of different dimensions in wood. The set is mounted on a mortising machine, either stationary or portable. The stationary machines are generally of Portuguese, Italian and German manufacture, and have a guide-sprocket center of 150 mm. The portable machines are generally of German and Japanese manufacture, and have a center of 70 mm. However, there are many other mortising machines with different centers in operation. The pitch is the distance between one pin in a link and the third successive one, as shown in the image below at right. “A” pitch (22,6 mm or .89") for mortises of 36 links that produce slots long 40, 50 mm or more, wide from 6 to 50 mm, and deep from 100 to 250 mm or more. Used for routine carpentry work. “B” pitch (15,75 mm or .62") for mortises of 48 links that produce slots long 30 and 35 mm, wide from 4 to 30 mm, and deep from 75 to 140 mm. Used for work requiring high levels of accuracy and precision. “C” pitch (13,7 mm or .54") for mortises of 54 links that produce slots long 20 and 25 mm, wide from 4 to 25 mm, and deep from 75 to 140 mm. Used for extremely precise work. 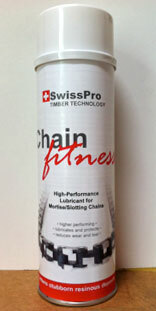 Choose "A" type chains for most applications of routine mortise work with North American timbers. 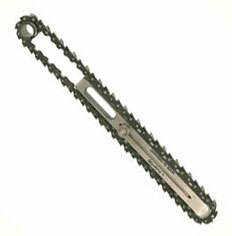 Choose "B" pitch chains for work of higher level of accuracy and precision. This chain is less aggressive and susceptible to breaking under duress. Choose "C" type only for extremely precise work. The guide bar is the part of the set on which the chain glides as it penetrates the wood. Our guide bars are of a length that allows the mounting of chains with a standard number of links. All guide bars come with an unique, patented bar end, which is supplied already assembled and tested. We supply guide bars of all shapes and sizes for stationary and portable mortising machines, for special applications with 1, 2, 3 and 4 bearings, and to fit the major automatic processing centres (Hundegger, Schmidler, etc.) which make use of guide bars that can make mortises 500 mm deep, or even 600 mm and more. The sprocket is the third component part of the set. It is fixed to the motor shaft of the mortising machine and transmits the rotary movement to the chain. It is manufactured with specially formulated hardened steels. for “C” pitch with 6 teeth (mortises 20 and 25 mm long). The inner diameter of the sprockets is typically 16 mm (5/8") on heavy-duty portable or stationary mortisers, but on some portables (Mafell) can be 15 mm.The teeth of the sprockets are arranged on one, two or three ring gear crowns, depending on the thickness of the chain with which they have to be combined. To find out which sprocket has to be used with a specific chain, you have to know the dimensions of the mortise to be made and the inner link size of the chain. The figures show the differences between the sprockets generally used for the different chain pitches. Few wood-cutting chain makers are left in the world, and some have deemed this technology obsolete. But how else do you cut mortises into timber frames or mortises for making windows and doors? Or mortises into fence posts? Or even holes into solidly frozen ice? While routers can do most of the job, they produce a lot of dust. That is why we are seeing a resurgence of cutting chain technology. Properly sharpened mortise chains outproduce any router or milling function. Mortise Chainsets for Hema, Protool, SwissPRO etc.